Dullstroom is considered to be the mecca of flyfishing in Mpumalanga, where it nestles in the centre of an extensive region suitable for trout fishing. Two species of trout i.e. Rainbow and Brown Trout occur in the numerous dams, rivers and streams. Anglers have a wide range of specialist tackle shops to choose from for that special fly, rod or reel. Expert advice is available from the owners and managers of the various shops. The Emakhazeni Development Trust in association with Oaklane Home Owners Association took on the task of resurrecting the Dullstroom Municipal Dam to its former glory. With a sound stocking policy and the introduction of Brown and Rainbow Trout, the dam now provides quality angling for the serious flyfisher. 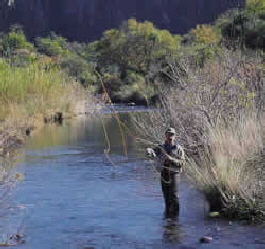 In addition, the building of a sister dam, Suikerboschkop Dam, has also resulted in excellent flyfishing. This Dam is reserved for members of Dullstroom Flyfishers. Enquiries may be made at the Tonteldoos Bistro and any tackle shop in Dullstroom, before fishing. "No person shall angle in flyfishing waters otherwise than with one line, with one non-spinning artificial fly attached to it." Any person, who contravenes or fails to comply with this subsection (1), shall be guilty of an offence and liable on conviction to a fine or imprisonment for a period not exceeding 2 years or to both a fine and such imprisonment.